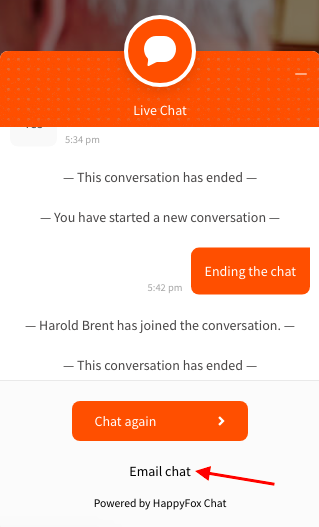 Chat Transcripts contain the entire conversation that happens between the Visitors/Customers and the Agents. 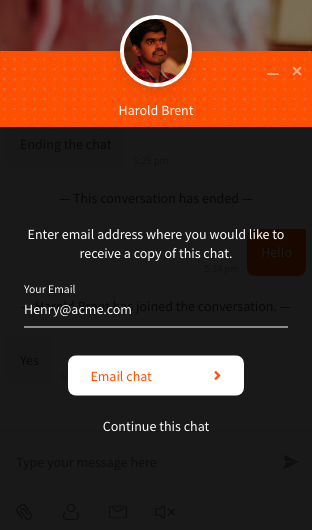 Customers/Visitors, who are chatting with Agents in the Chat Widget can also email the Chat Transcripts to him/her. text box of the visitor widget and provide with their email address and click 'Email Chat' to get the Chat Transcript. 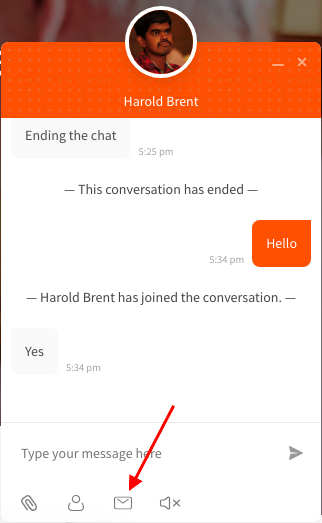 2.They can click on x button at the top right corner of the widget and end the chat and then select 'Email Chat' hyperlink below the Chat Again button to send the E-mail of the whole conversation to the email address of their choice. Only Admins have the access to choose, on who can receive the Chat Transcripts. By default Admin's email id(the one who created the HappyFox Chat Account) will be there in it. Admin can either change the email address to a different id or can remove it and keep it empty if he prefers not to receive any Chat Transcripts. Note: Offline Messages won't be sent to your email address,if there is no Email address in the Chat Transcripts.